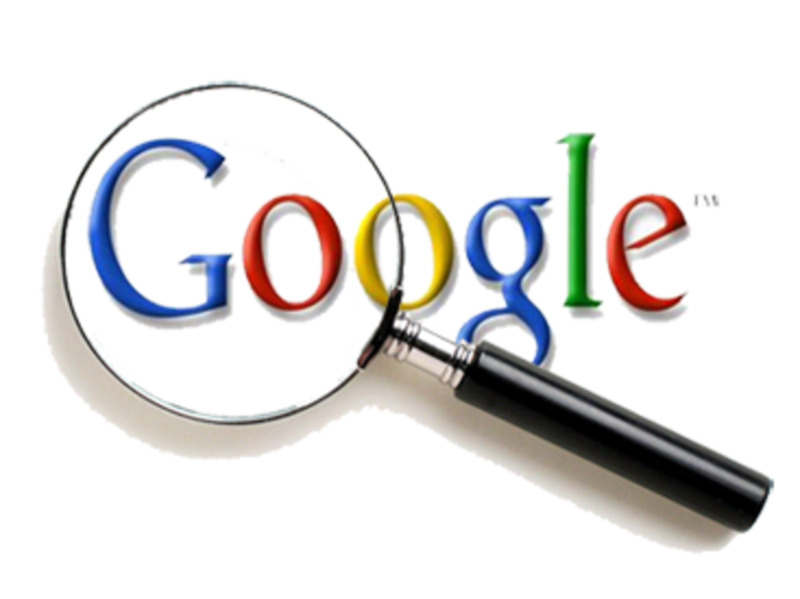 With Google Authorship, you increase your chances of getting found online! 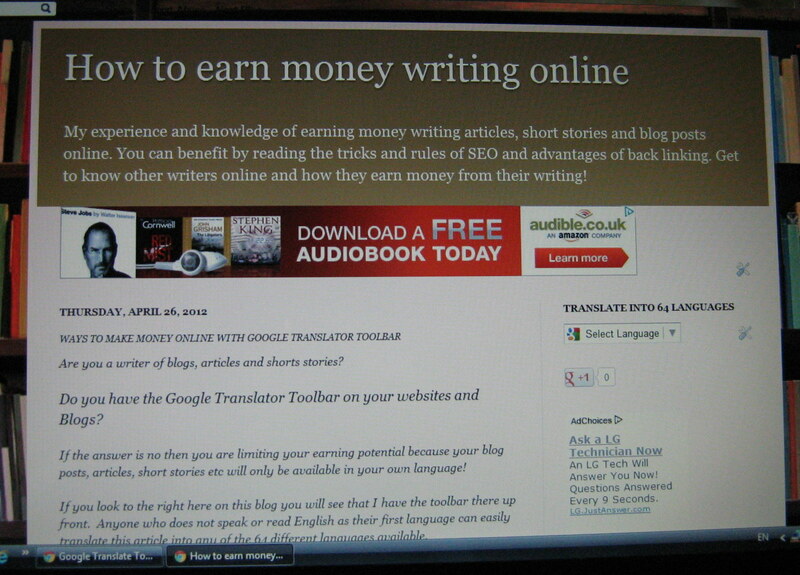 Not yet Google Adsense Approved? How to Finally Be Accepted in Google Adsense? Here's an article that will enable you to identify the rejection issues that will help you get accepted in the adsense program and have an account. This fairly new feature of Google enables you to associate your online content with your Google Plus profile. Through this feature, you get to verify and claim authorship of your hubs, blogs and web content. And to top all these, it enables you to have a photo of you in search engine results which increases your online visibility. By having a photo appear in the search engine, your articles will have a higher chance of getting noticed. And thus, Google Authorship has the tendency to bring in more traffic to your hubs. With this, even if your articles don't take the first 2 or 3 spots of the search results, you will still have a good fighting chance of being visited. In my case, upon implementing. And if you are under the Google Adsense program, you will be able to monetize those increases in traffic. See how awesome it looks when you can have your photo beside the link to your hubs? Why should you activate your Google Authorship? Now, let's get to the core of this article and explore how you can claim your Google Authorship. Have you already set up your Google Authorship? Yes. And it's super awesome! Yes. But it's still being processed. No. I don't think it will benefit me. It's my first time to hear about it. Will try it soon! 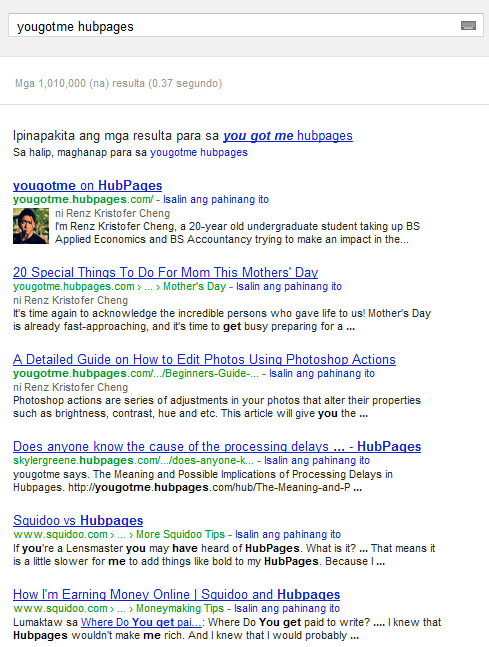 For Hubpages, check out the photo below. Have a Google Plus Account.It is only through a Google+ account that you will have an authorship claimed. So, if you already have one, you can now proceed to the next step. But if you still have no account, create an account now. Don't forget to include a good, recognizable headshot as your profile photo. This is a vital requirement to have your authorship claimed. So if you have other picture not representing you, change it with your own photo. Write a good description of you on your profile. This is also very important. Google wants you to have a good description of you as an author and perhaps some interesting facts about you. Register your account. Go to plus.google.com/authorship, sign up with your email (preferably your Gmail Account) and click on the verification link Google will send you. Link your Google+ Profile from your webpage. After setting up the prerequisites, you now have to link your profile from your webpage (e.g. Hubpages or Blogger). Check out the format on your right. All you need to do is copy the code anywhere in your webpage and replace the [profile_url] portion. There is some cases where you can't edit the HTML of your page (like Hubpages). But there's a remedy to this. You may check it on your right (after the "Linking Google Profile"). All you need to do is to insert a hyperlink on your name using the said format. Link Back from Google+ Profile. 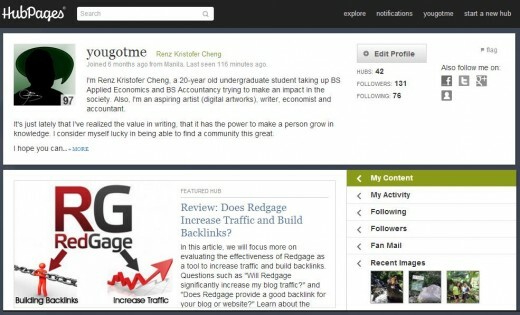 Add a reciprocal link back from your profile to the sites or pages you just updated. Go to the Contributor To section of your profile. In the dialog that appears, click Add custom link, and then enter the website URL (use the url of your main page). Verify Google Authorship. Go to the Rich Snippets Testing Tool.Type in your page or website and click on Preview. Check out the photo below. On your new profile page, click on Edit Profile. You will be brought to a page where you can edit your personal detaiils, featured hub and social network accounts. Scroll down until you reach the Links category. You will see there Facebook, Twitter, Google+ and etc. Fill in the input space with a link to your Google Profile with some additions to the url. For this step, you may refer Special Case: Linking Profile Without HTML above. Verify if you got it right by going to the rich snippets testing tool. (Kindly see the Step 6 of the above procedures). I hope you find all these steps easy to follow. Take note that you need to wait for about a month or so before it takes effect. It's not an instant process, so don't get frustrated if you won't see your photo in search engine results. It takes some patience too in order to get your authorship claimed. Good luck! Don't forget to leave a comment in case you have some inquiries or in case you just want to share your success in having your Google Authorship. Want to be part of Hubpages? Be part of this writing site, and start building your brand and online reputation. Hubpages is an establishing writing platform that may provide your blog and website the exposure that you need! This is a guide on how to use the Hubpages Estimation and Analysis Tool. If you are wondering what this tool is all about, you'll be able to read about it here. In the Hubpages Community, writers are given a challenging yet fulfilling quest of winning accolades. But what do these accolade say about you? Thanks for the info. I've claimed Google authorship here at HP and for my websites but I forgot how to do it. I just started a new site and was trying to remember how to claim authorship again, so I searched HP because I know there are some good articles on the subject here. I found your article and I know you always give good and useful info, so I came here to find out what I needed to know. Thanks again. @eugbug Thank you for the comment! Yup, you add it up on the Google Plus link on your profile. No need to add it on each hub. Hi Renz! This is fairly straightforward but I'm a bit confused about adding the ?rel=author part. Do I add it to the Google+ link when I edit my profile or must I add a hyperlink to each hub? 1) Can I add the entire blog (http://blog.example.in/) into custom field, instead of pasting each & every post. You're welcome! Thanks as well DonnaWallace for dropping by! Nice hub. Thank you for sharing. Thank you so much for this post, really helpful! I'm quite excited to see my photo on search results page in the coming months. Voted useful. Thanks for the easy-to-follow directions. I have claimed authorship, and on some results, my headshot is displayed, on others, it isn't. Although I haven't seen an increase in traffic yet! Good thing I saw your article. Will definitely do this! thank you! Thanks for sharing how to do this! I had deleted my Google Plus a little while ago because I never used it. Now I just set it up again - I hope it works! Voted up and shared. @Natashalh Yup, I also have this on my blog, and somehow they are helping in getting my posts/articles noticed. Awesome info! Very important to me, thanks! Upvoted/awesome and following. Peace. Kawi. Bookmarking this hub right now and doing the deed tomorrow when I have some time. A big THANK YOU! Thank you for the instructions on how to include a G authorship tag on HP! I use it on my blogs, but it could certainly be useful here, too. For this great hub, you need a special accolade - just for you! Bookmarked for a re-read in freer times (hope I can say freer and get away with it) - Shared ! Thanks Cyndi10! 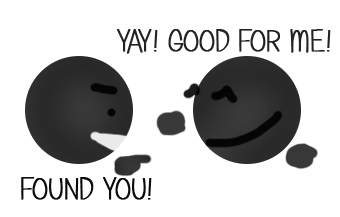 I'm glad you found this hub useful! What a fantastic article of information! I wondered how those pictures appeared in the Google searches and what could be done to have that happen. Thank you for sharing this with us. I'm sharing this, as well. @dghbrh Thank you for the comment! Wow, this is amazing information here. I do have a google + account. I need to claim authorship. Thank you for sharing this. I will be following this hub for this process. What about hiding the extra info it adds to the meta description, like how many google circles you are in? Not that I would want too, just wondering. You make this look very simple and I'm looking forward to coming back to it. Thanks! Thanks for the tutorial. I always wondered how that worked. I'll be sure to get this set up. Does it improve any SEO? Thank you, thank you, thank you! I didn't know about Google Authorship. I'm getting a lot of tweaking done now. You did a great job laying this all out for those of us who have trouble with technical things. @CloudExplorer Thank you so much for the comment, it really boosted my day up. Actually, I came across Google Authorship unexpectedly, and glad that I did find it. 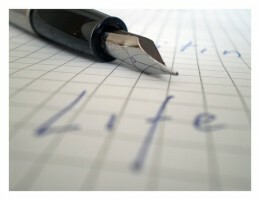 Signing up for Google Authorship is on my to-do list now. I appreciate the information you've provided here and the heads-up on Google Authorship. Awesome helpful and useful tips here about the Google Authorship option there on G+. I heard about it 2 days ago or so, and yes indeed I will be using your hub here to make my Authorship claim there on G+, thanks for providing such a informative tutorial guide for us all to figure out how to do it. Cool stuff Yougotme, Thumbs up and getting shared! I love technical hubs, and yours surely was awesome indeed. Great info! Need A headshot first. Many Thanks! Good one, Renz. :) Just signed up for mine. My site stats mainly came from search engine results even before anyway, so I thought, why not right? Thanks topaz blue! Have you verified your Google Authorship already? Excellent hub! Thanks for sharing!